This festival occurs forty-nine days after the exodus from Egypt. The positive commandments of this holiday are to bring the first fruits to the Temple in Jerusalem, to rejoice on that day; and to refrain from work. Since this holiday coincided with the giving of the Law at Sinai, it is permeated with an unusually important content. Our Sages consider this holiday as an extension of, and as the final day of Passover. All of the above indicates that the bringing of the first fruit can be done only in the Holy Land. 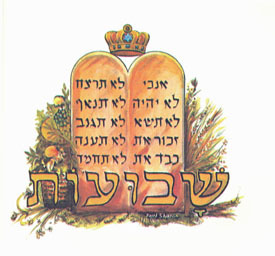 Many of the Torah's commandments are contingent on living in the Land of Israel. The custom of the Sephardic Communities is to stay awake the entire first night, and to recite the Law and the holy Zohar. On the first and second days of this holiday, it is our custom to read the Azharot of Ib'n Gabirol and the Book of Ruth. We should be extremely joyous in knowing that on this day we were selected from all the nations to become His people. The immortal words of Saadiah Gaon remind us that our people is a nation only by the virtue of our Torah. Shabuot, the festival of receiving our Torah, is observed on 6 Sivan. Shabbat Kallah and 1 Shabuot Hazzanut Notes of Hakham Moshe Ashear from 1939. Pizmonim for the Shabuot festival according to Sassoon Manuscript #647, Aleppo, circa 1850.